Welcome to The Nifty Tech Blog! This blog came about because of an event that happened not too long ago. A friend of mine sent me an e-mail about a new piece of tech that he had discovered and that he thought that I might be interested in. It turned out that his new discovery was something that I had been using for months. In fact, I had tried to tell him about it when I discovered it and he hadn’t been interested. So this blog is an attempt to time-shift some of my discoveries. I can write about products in the height of my enthusiasm, and my friends can discover them when they’re ready. And with a little luck, I am hoping that others will flock around and give me their suggestions on nifty tech items to share with the world. Starting out, I’m going to be publishing reviews every two weeks, but there may be the odd special event item or commentary published from time to time. If things work out well, I’ll step up the schedule. So I’m going to start out this little adventure with the same product that my friend recommended: Delicious Library. Delicious Library 2 is a product from Delicious Monster (http://delicious-monster.com). As of this writing, the latest version is version 2.3.3 and is available for $40, although a limited free download is available. So what is Delicious Library, and why is it Nifty Tech? Delicious Library is an inventory application for the Macintosh (Sorry Windows, and Linux people, it is Mac OS only right now). DL was originally designed to help users keep track of their book and movie collections, but soon evolved beyond that. So it is an inventory application. So what? What is so special about that? Well, there are several nifty things about DL, but by far the Niftiest of them all is the method by which you enter your items into the library in the first place. DL makes use of the built in iSight cameras in all the late model Apple computers. Just take your book, or your CD or DVD, or the box from your latest toy or gadget or piece of software and hold it up to the iSight camera, and Delicious Library will scan the barcode of the item, connect to the internet and identify the book, CD, etc., and download the relevant information, and a photo-realistic image of the cover or box of the item. 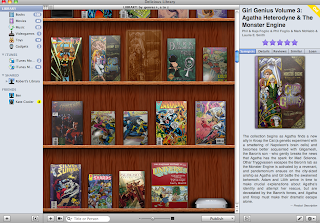 DL displays these items on virtual “shelves” so you can look at your titles with a glance. Just show the computer what you have and it will identify your stuff for you! How cool is that? Naturally, DL sometimes makes mistakes, and sometimes you have an item that is so old or obscure that it cannot correctly identify it. Fortunately DL has a convenient display of characteristic that makes it easy to manually enter the information about the items it can’t correctly identify. For more convenience, you can buy an optional Bluetooth barcode reader that will feed the data wirelessly to your Mac, or will store up to 4000 barcode entries if you wander out of range. But hold on to your hats if you want to go this route. Delicious Monster only sells the barcode scanner at the time that you buy Delicious Library. And it isn’t cheap. It may be cheaper than you’ll find elsewhere, but $215 is still a significant chunk of change. Even for a supercool barcode scanner. So once you’ve entered your items into the library, then what? More nifty stuff. Do you have friends who borrow your stuff? Just create an entry for each friend. DL creates a virtual “shelf” with your friends name on it, based on an address book entry. Now drag the item borrowed from your regular collection to your friend’s shelf. DL makes the connection, and if you’re wondering what you’ve loaned out to whom, DL keeps track of it. When it gets returned, just drag the item back to the main library. Items on loan show up on your library shelves as phantom items. You can create your own shelves to represent different locations. Work, bedroom, library, whatever. Or you can create smart shelves based on your own rules against any of the data fields in the library. For instance you could bring up everything that cost more than $100 dollars. If you’re looking to reduce your stuff, DL can help you find your most sale able items. DL pulls data from Amazon.com and gives both the retail price and the current asking prices. It can suggest similar items to things in your library, and can help you list your items for sale, or help you buy new things if you’re flush with cash. Once you’ve compiled your library and gotten it the way you want it, you can share it with your friends who also use DL over a network. Or you can publish it to the web, or to a Mobile Me account. In addition to sharing your library items, this provides an off-site backup in case someone steals your stuff and you need to provide the insurance company an itemized list of what things are missing. Delicious Library provides a lot of useful tools to help you manage your library items the way you want to. It doesn’t take the chore away from you, but it provides enough tools to help encourage you to do it in the first place. And the Delicious Monster crew seems dedicated to making continual improvements to evolve the software. It may not be for everyone, but for an easy entry price of $40, there are bound to be a lot of people who will find it Nifty Tech. This is definitely a tech tool I find interesting, I have a huge collection of books I am trying to organize and in many cases, to sell. Having a tool to help me do that is going to be very important, since almost all of the books are in boxes following a move. Got my hands on the first Delicious Library when I was still with Apple… and now use DL 2 to keep track of all my stuff whenever I move, and just in general. It's a great program, and I love it. Great review! This not only works with books, dvds, and software, but also with gadgets, toys, clothing, almost anything with a barcode. I am slowly entering all of our LEGO products so we know what we have and how many we have. Yes, DL2 will even keep track of how many of something you own as long as you tell it you have more than one. The bookshelves reminded me of the nifty shelving in Ravelry's site, but that scanning ability? Uber-nifty. This is one I hadn't heard of before, and it sounds interesting. I'll be checking it out. I think I must have found this product a year or two ago, thought it was nifty, but didn't buy it. Now I'm taking on a project to set up a small lending library for my church, and upon learning the RE director has a shiny Mac this was the first thing I thought of–and it turned out she already had it. I've downloaded it myself to play around with it a bit more, and it has radically improved since I last saw it. Definitely brilliant. Welcome, DDog!Yup. One of the great things about Delicious Library is that they are continually working on updating it. Tweaking things and adding features based on customer feedback. It isn't always the fastest process, but they are committed to working at it.